Olga Kikou is European Affairs manager at Compassion in World Farming. After many years of negotiations and 18 trilogues, the end is near for the completion of the work for a new Organic Regulation. It’s been a long and rocky road to reach consensus. The file was very close to being abandoned a number of times due to many thorny issues, such as pesticide residue limits in organic products or organic greenhouse agriculture. Rapporteur Martin Häusling (Greens, DE) was under pressure to bring this file to a satisfactory conclusion for all sides. A few weeks ago, after winning a slight majority in the Council, the agriculture and rural development Committee of the European Parliament voted in favour of the new organic rules. The bill is expected to be voted in the plenary session and in the Council in spring 2018 and will enter into force in January 2021. While many issues caught the attention of policy makers and producer organizations, animal welfare was side-lined, as is often the case in conventional farming where producer/economic interests outweigh citizen expectations resulting in maintaining the lowest minimum standards without moving in sync with societal demands. The welfare of farm animals is highly important to European citizens. 94% of them consider important to protect the welfare of farm animals, according to a Eurobarometer survey, and more than four out of five respondents support the view that, based on current standards, farm animal welfare needs to be improved. Organic animal production standards leave a lot to be desired. They lag behind consumers’ expectations. Few citizens are actually aware of how animals are raised in organic production or of the specific rules for each species. There is a general understanding that standards are much higher in organic animal production but this reveals a deep gap between idyllic farm images with free ranging animals in pastoral surroundings and existing reality in many farms. In a few cases, conventional production actually surpasses organic standards as some producers seem to be adopting alternative models of farming. The limited participation of animal welfare organizations while the file was being debated in the EU institutions testifies to the lack of awareness and involvement. Convincing politicians and EU governments to strengthen rules and raise standards proves to be quite cumbersome, if public attention is lacking. Although the new Regulation leaves a lot to be desired in terms of animal welfare, it can be considered as a small step forward. 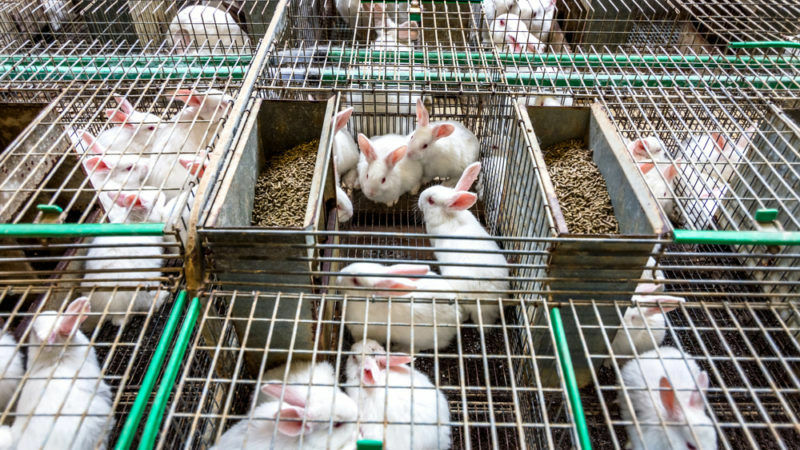 Among the most positive outcomes are the new rules for organic rabbit production. Despite rabbits being one of the most farmed species in the EU, specific organic standards were lacking. As in existing rules, the use of cages, boxes and flat decks to raise animals are not permitted for any species. Housing conditions and stocking densities have to take into account the behavioural needs of the animals and ensure they have sufficient space to move around. On the other hand, access to pasture for some species is encouraged but not mandatory. While tail-docking of pigs and teeth clipping have been prohibited, de-beaking is still authorised, when undertaken in the first three days of life. Tail-docking for sheep, dehorning and disbudding are also allowed, although exceptionally and on a case-by-case basis. Tethering of cattle is allowed for holdings with less than 50 animals, excluding young ones. Physical castration of pigs under anaesthesia and/or analgesia is still allowed, a questionable procedure which causes immediate and long term pain. Surprisingly, alternative methods (i.e. immunocastration) that would not involve pain and suffering are not allowed. Artificial insemination is allowed in reproduction. Moreover, transport and slaughter of animals in organic farming fall under the same rules as in conventional farming. Although the sector is still quite small, the organic market is rapidly growing, resulting in an estimated worth of €27 billion. Consumers expect high standards of animal welfare in organic animal farming and they are one of reasons why they choose to buy organic. The EU institutions ought to show strong commitment to address weaknesses in regards to animal welfare rules. They should not be keen to protect the profits of the sector while undermining the welfare of animals. The EU organic logo brings certain guarantees about high standards of animal welfare, among others, and European consumers who buy organic products have certain expectations. Increasing consumer confidence by introducing higher animal welfare standards and ensuring good welfare will boost organic food production and address growing public concerns regarding animals.